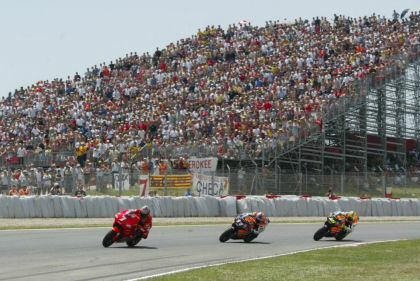 In 2005, a new rule for MotoGP was enacted that flag-to-flag. Previously, if a race starts with a start in the dry circuit conditions and the rain fell, leading drivers to raise their hands to stop the race, so also with the official red flag to stop the race, then the race begins again with wet tires. Now if the rain fell during the race there was no red flag, the drivers directly into the pit to change tires at the discretion of the team. In 2007, the MotoGP class derived engine capacity, a 800cc. In 2010, imposed restrictions on the MotoGP class machines for 1 season 6 engine. In 2010, the 250cc class was replaced by Moto2 with 4 stroke 600cc prototype machine. In 2012, the MotoGP class was increased engine capacity, a 1000cc.